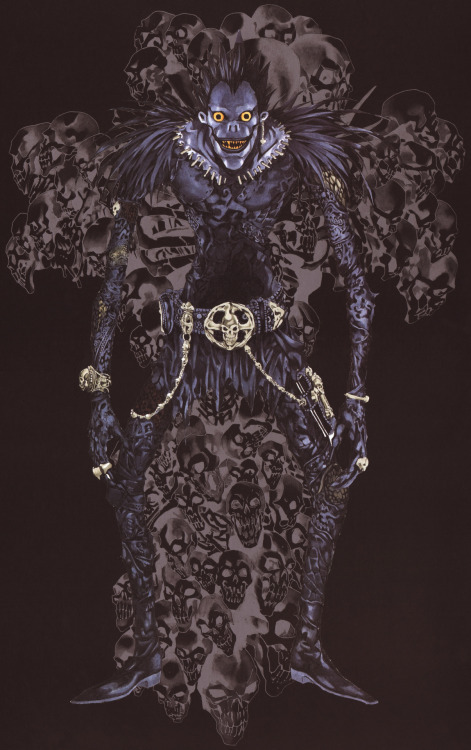 Ryuk is a death god featured in the manga/anime/live-action-films called Death Note. Have no clue what I'm talking about? It's this guy right here! I based my costume mainly on an image from Takeshi Obata's Blanc et Noir (an art book by the artist of the Death Note manga. See previous link for the particular image I'm talking about). This costume is made up of a long leather shirt, leather pants, leather boots, a pleather-and-leather belt, leather belt bag, leather notebook, 3 resin rings, 2 bracelets, earring, "arm skull", buckle, belt end, chain connector, pen, belt and notebook cross, shrink-plastic chain, staples and teeth, latex mask, resin eyes, "painted" and styled wig, and a whole lot of feathers. Everything was either made or heavily altered, including the boots. The leather outfit was made of over 80 pieces of leather patch-worked together. I used an old ill-fitting trenchcoat, bought a few coats from Value Village and was given an old pair of pants from my brother in law. I took them all *completely* apart, so I was left with (mainly) rectangular pieces of leather. Individual pieces were drafted and cut out, given texture with a wood-burning tool and sewn to other pieces. Zippers, grommets, studs and cords adorned the pieces, along with kneepads and a spine (both of which were formed by soaking leather in water and leaving them around light bulbs and an ice cube tray). For the feather epaulettes, I pulled the tips of the feathers through fabric and dabbed a bit of hot glue on them to hold them in place. This feather-adorned fabric was sewing to giant shoulder-pads I had made (that were later sewn onto the shirt). There are over 350 feathers. I lost count. I made a new head/upper-torso armature to sculpt on. Apparently I can no longer sit still, so when my husband was putting plaster of paris bandages on my back, then front, I kept jerking my head back, so the mold came out a little wonky. It was "good enough" for my purposes, so I cast a wonky copy of myself out of cement. I sculpted Ryuk's head over my armature using sulfur-free oil-based clay. I made a two-piece Ultra Cal 30 mold of the sculpt, then cast a latex positive. The mask was painted with acrylic paints mixed with a latex paint base. The wig was "painted" black and glued to the mask. The eyes were made by cutting two ping-pong balls in half and pouring resin into the halves. The middle of the eyes were drilled out, then the entire inside of the eyeballs were dremelled down so the pupils would fit inside them. The pupils were from broken sunglasses that I cut and dremelled down to a circle-ish shape. You could see quite clearly out of them - when they didn't fog up. Almost the various accessories (belt parts, rings) were also sculpted out of clay, then cast in either resin or latex. For a complete step-by-step on how I make my latex/resin masks, please take a look at my Terminator and Donnie Darko instructables (for those curious about resin casting) and my Asari Headpiece and Princess Leia Bikini (if you want to know more about latex casting). This costume would not have been possible without all the Ryuk cosplayers out there; I looked at many-a-photo before I even started mine, and was delighted to see a enthusiastic crowd of people making this costume. On cosplay.com, QueenToast, SuzzyToast and fly_aguilera have some of the best Ryuks I have ever seen. Ryuk could also not have been done without the help of my husband, who helped bandaged me up in plaster-of-paris, and who helped/was *needed* to help get me into costume. Thanks to Marmbo/Clint Hay for some of the photographs. And thanks to my friend Rachel; it took three of us to transport cement back and forth between locations to make my new head armature! The entire costume took over 2 solid months to make. I'm still recovering. Shrinky Dinks! Man, I miss those...nostalgia. Where does the craft foam come into play? Craft foam helps strengthen (and bulk up) your Worbla - so you take a piece of thin foam and sandwich it between two pieces of Worbla. Now, since they are just teeth, you may be fine with just cutting them out of one piece of Worbla. Or you may find you have to fold and double-up your Worbla - or it may look best with the foam in the middle. Because Worbla is expensive stuff, I'd say just go for the one piece if it looks right!... actually, I'd probably end up cutting up like a yogurt lid or milk jug; save that precious pricey Worbla! I'm confused slightly of how you made the bust, and mask. So you made a plaster cast bust of yourself (using bandage wrap? Then plastering it? ), then put cement over or inside the plaster mold? When you make negative, you line the interior of the cast with Latex? Or does the clay sculpt have to be inside it as well? We made a two part plaster-bandage mold of my head - it's not bandages that later have plaster slathered over it, it's bandages that already have plaster embedded in them. Like what the doctors would use for putting a cast on a broken bone. Just using regular plaster can be dangerous. Into that two-part plaster-bandage mold, you pour the Ultra Cal 30 (as a result, you get a "cement" head cast/bust). On top of the bust, you sculpt a mask out of clay. Then you make a two-piece mold of the sculpture out of Ultra Cal 30 and cheesecloth/burlap. You remove the two-piece mold from the clay sculpt/bust, clean out any remaining clay from the mold, then do a final positive cast of latex - and that's your mask. I made a mockup of both the shirt and pants using Burda 7742 and McCall's M6173. You're supposed to use stretchy material for those patterns, but I used a non-stretch fabric for my mockups, and used less than 4 1/2 yards of fabric for that. For the shirt (as an example) I put together a basic top using the pattern pieces provided - so you're sewing two arms, a front half and a back half together. Then I tested that on my body to see how that fit - keeping in mind that a zipper would be going on the back, so the shirt can fit tightly. Once pleased with the fit, I drew a patch-work pattern on the shirt, and cut out those pattern pieces, labeling them as I went (so you knew what would be sewn to what). Then, adding a seam allowance to all the pattern pieces, I cut them out of leather and then stitched them together! Thanks. Seems this is beyond me you. I haven't a clue about sewing, don't own a sewing machine, cant afford one. Don't let that discourage you - there's youtube, the library, even classes on Instructables, that will teach you how to sew! Just think of how cool it is to learn how to do something new. Hi, I was wandering about the feathers you used. Ive searched for feathers online and there are so many selling any different species of feathers. Did you use a specific feather from one animal or is there a specific "costume" feather you would recomend? You have the best Ryuk ever! I'm a noob at all this, and was wondering if you could give me some guidance on creating the shoulders. I was wondering if there's a specific type of shoulder pad I should buy? Or a specific type of fabric I should get that I would be able to pull feathers through? For example, out of this list, is there a specific type of shoulder pad that you'd suggest? Thanks a lot, and Happy Halloween! The shoulder pads I made were soft - I'd actually recommend just buying some thick foam and shaping it! I think that'd be more comfortable and lighter than having rigid ones. For the fabric, you'll want something with a looser weave (or even visible tiny tiny holes) - something that you should be able to easily put the end of a feather through. Hope that helps! Excuse me, Tatterhood? I wanted to try to make this cosplay, and I had a couple of questions for you before I make my final decision on whether or not to make it.